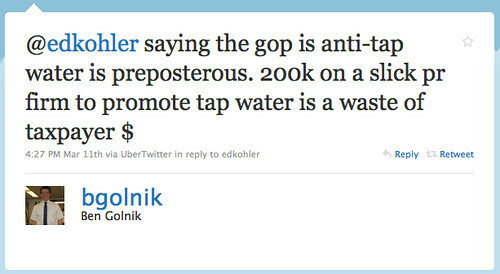 Note: While I think it’s preposterous that the MN GOP’s would take such a shallow stance, I want to be clear that I don’t think all Republicans are anti-tap water. This is just the kind of absurd things that happens when political operatives drink too much non-tap water based Kool-Aid. Maybe it’s just me, but I’m glad to hear that a “slick” PR firm was hired since I’d hate to hear that we hired a banal PR firm. More to the point, the campaign crowd within the MN GOP seems to be working overtime to find examples of waste in the Minneapolis city budget to attempt to frame Rybak as some sort of spend thrift (a spend thrift with a balanced budget). In this case, they’re suggesting that investing in marketing a public utility is a waste of taxpayer dollars. Why Do We Market Public Utilities? In Ben Golnik’s world, it’s apparently okay for cities to provide public services such as safe drinking water for a fraction of a cent per gallon to every tap in city, but if you tell anyone about it, you’re wasting taxpayer dollars. This makes me wonder if this applies to other public services as well. What if a city provided 911 emergency services but never made an effort to educate people about it? I remember police officers visiting my elementary school classroom to explain 911 to me (back when dialing 9 took a lot longer than dialing 1). It certainly isn’t free to send police officers out into classrooms to explain how and when to call 911. Would Ben Golnik view that as a waste of money as well? We also hear cases of 911 emergency services being abused by people who call 911 for non-emergencies, potentially putting people facing real emergencies at risk, while putting a burden on the wrong city department. Would it be wrong for the city to invest in a PR campaign that reminds people what 911 services are for? If spending money to market city utilities is wrong, perhaps this would also be a waste under the campaign mindset logic of Ben Golnik, Luke Helier, or Marty Seifert? Why Would a City Market Tap Water? In a 2007 telephone survey of 1,606 Washington residents, more than half said they trust bottled water more than tap. For young people (under age 35), fully 61 percent said they trust bottled water more. Yet tap water is arguably more highly regulated and controlled than bottled water. And, in blind taste tests, municipal tap water often meets or even beats bottled water. The lack of trust in tap water creates a downward spiral: When ratepayers don’t trust tap water, chances are they will be less inclined to pay for infrastructure improvements and necessary rate increases. This affects a utility’s bottom line and, ultimately, its ability to provide safe and reliable drinking water over time. They also provide a tap water marketing toolkit for use by municipalities who want to get the word out. It sounds to me like there are some significant long-term benefits to having a high tap water participation rate. And if you want to get the participation rate up, you just may have to invest in public relations. The interesting thing here, which may be over Ben Golnik’s head or something he simply hasn’t considered, is that the return on investment may be most heavily reflected in the city’s waste stream. Find that here in Part Deux (tomorrow). Hey, I got a pretty nice aluminum water bottle out of the deal paid for by Minneapolis taxpayers. Thanks. Oh and I’m a Republican (not a GOPer) that supports drinking tap water.